88 Printhead (Magenta and Cyan) is rated 4.1 out of 5 by 43. Rated 1 out of 5 by Stu123456 from Got burned again, This product has flaws. The HP series of office printers that use the two color printheads have been a real puzzling and frustrating experience. When the printer is new, all is well. When the printheads fail (sometimes within the first year) and you get a message to replace the printhead you might as well throw printer away because purchasing a new printhead will not solve the problem and the printheads are expensive. Further frustration occurs because the printer takes a very long time to go through it's diagnostics and then you get a message to replace the printhead of which you just did. In our office we had 8 of these type of printers and they all experienced the same problem with the failing printheads of which when you replace with a new one the problem is not solved. Rated 5 out of 5 by MortgageBoss from Saved my Officejet Pro 7780 My 2007 Officejet Pro 7780 wasn't printing color for the past 18 months, but I never got error messages about a "bad printhead". Finally, after attempting to clean the printheads, the entire printer went dead (with appropriate error messages). I had two choices: Take a chance that a $200 re-investment would work, or purchase a new printer. I took the chance, even though my 7780 isn't supported any longer, due to the fact that this printer's features: Color/BW scanning and printing, with dual paper trays and automatic feeder ARE NOT readily available with new HP models for HOME OFFICE USE. It's either pay thousands of dollars for a small office machine or accept a lesser machine at an affordable price. 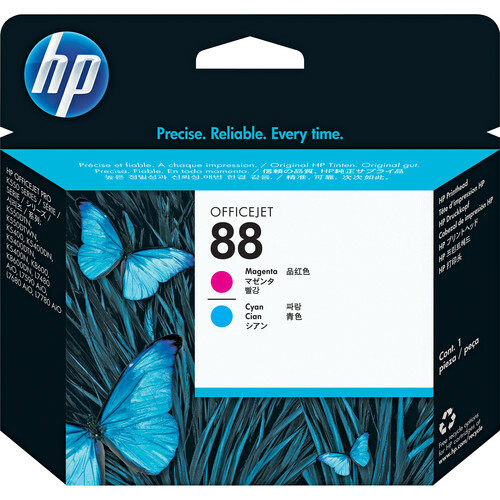 I sincerely hope that HP continues to support it's older family of product with HP 88 ink and printheads. There a good many of these devices still in service and working well for your customers'. Rated 2 out of 5 by prgal from Frustrated I have an HP L-7680 and have had it for about 3 years. I had replaced the printheads about a year and a half after I purchased the equipment. Four months ago I was required to changed the Magenta/Cyan printhead because the printer stopped working. I received it and it still did not work. I was sent a replacement and that worked...until a week ago when my printer stopped printing anything with Cyan and it now shows that I need replace the printhead again. I figure that it has cost me about 4 hours of my time plus the cost of the printhead and the frustration of not being able to do my job (I office at home and I HAVE to be able to print). I'm still not having problem with the black/yellow printhead and I use black more than any other color! It's becoming very costly to own this equipment. Rated 2 out of 5 by Barney2 from Print head problems My HP Office Jet Pro 5100 has been in use for some time now and I have replaced all the printheads a couple of times. For some time now the software in the machine will not recognize the new printheads. The first time I called customer service and all they could suggest was buying a new printer. I have found that i can install the non working old printheads and let the machine run through the setup and without turning it off, swap in the new printhead. The process must be repeated if the printer is ever turned off. They sould make printheads that will work with the printer. Rated 5 out of 5 by crusing75 from I do recommend these products to others. These print heads work very well. They were easy to install and everything is going very well with all my printing after getting them in. Thanks for your quality replacement products!! Rated 5 out of 5 by T. Parker from Don't throw your printer away! Someone gave me a printer and said, It doesn't print properly anymore. Maybe you can use it for parts or something. This was a fine HP All-In-One printer, scanner, copier, fax... all it needed were replacement printheads and some fresh ink. Works like new now for a fraction of what I'd have paid for a new printer. Easy to replace printheads, so you have no excuse! Don't throw that old printer away before you make sure you just don't need to replace some consumables! Rated 5 out of 5 by boshog from It worked Find it hard to believe that the print head goes out 1 x per year!! Rated 4 out of 5 by willie29 from Good I purchased a printhead and it worked for a short time 2 days). I then purchased a second printhead and it has been a week and it seems to be working well. It would be nice if I got a refund on the first prnthead ;that only worked to a couple days.